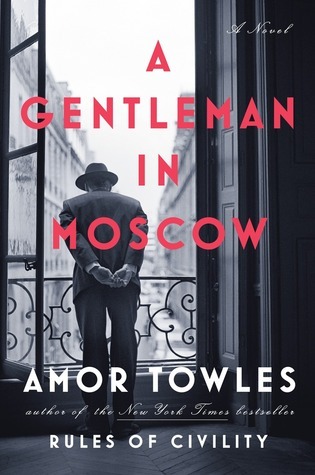 Since its publication in 2016, and into 2017, A Gentleman in Moscow, by Amor Towles, kept coming up as a book I MUST read. The best book of 2016, they said. One reviewer said A Gentleman in Moscow was her best book EVER. After a long wait at the library, I finally got the book, and dove in. It’s not that I was disappointed; I just was a bit underwhelmed. Don’t hate me All of You Book Reviewers Who Loved This Novel. Just recognize that I’m not nearly as sophisticated as you. Towles wrote a book called Rules of Civility published back in 2011. I read that book and liked it, but recall that it took me a very long time to get into the story. So when I found myself having trouble getting into this novel, I didn’t get discouraged. It helped that Towles’ writing is truly beautiful and elegant. It fit the story perfectly. A Gentleman in Moscow tells the story of Count Alexander Rostov, a Russian aristocrat from a long line of Russian aristocrats. The story begins in 1922, when Count Rostov is tried by a Bolshevik court for being an aristocrat. Communism, you see. He is placed under house arrest at the Metropol Hotel, a real-life historic hotel in Moscow. He must live out the rest of his days within the confines of this elegant hotel. He has pretty much the run of the hotel. He can eat in the dining room; he can get his hair cut at the fancy barber; he can drink cognac at the bar. He just can’t leave the hotel. The years pass, and the count has a series of relationships that are funny and poignant and interesting. Of particular note is a close friendship he develops with a young girl who lives with her parents in the same hotel. She provides him with not only friendship, but with a quirky outlook that is welcome given the fact that he can’t even go outdoors. The book is really a series of vignettes. The writing, as I stated above, is eloquent, and fits nicely with the beautiful art deco hotel and the roaring twenties. The book follows the count throughout the next few decades into the 1950s and the Cold War. Really, nothing much happens. Perhaps I was just at a time in my life when I needed a bit more action. I really did like the author’s writing, and Count Rostov was a likeable character, but I simply found myself skimming a lot of the chapters. I also found myself wondering if the leaders of the Communist party, particularly that close to the overthrow and murder of Tsar Nicholas II and his family, would really have allowed an aristocrat like Count Rostov to live such an unfettered life. It just didn’t seem realistic to me. I’m definitely in the minority, at least when it comes to the reviews I’ve read. The book has been highly regarded. Recommended for those interested in beautiful writing and less interested in a fast-paced story.